This collection makes available several hundred works for solo guitar by such 19th century masters as Aguado, Arcas, Carcassi, Coste, Chopin (transcriptions), Diabelli, Granados, Mertz, Molino, Regondi, and Tarrega. 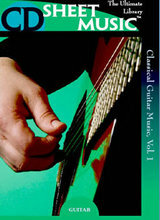 This collection brings together virtually the complete solo guitar music of Mauro Giuliani and Fernando Sor, as well as works by J.S. Bach and Nicolo Paganini.